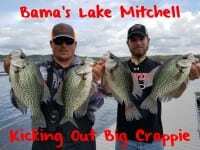 Prior to mid-week catching large sums of crappie on Kerr Lake wasn’t a chore. 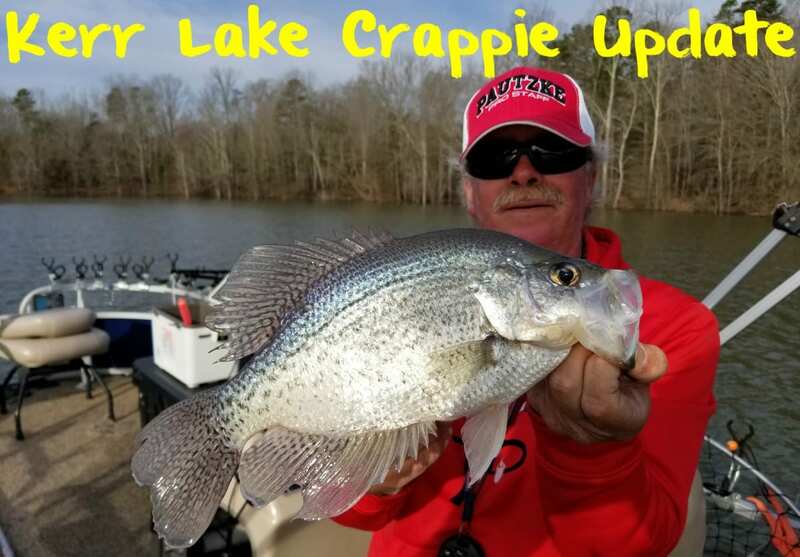 Meanwhile, in response to a week of instability Kerr Lake crappie are frustrating anglers. This pattern will likely persist until atmospheric stability returns, which hopefully happens soon. Currently crappie are scattered and have backed off recent migrations toward the back of creeks. We filmed on Kerr Thursday with veteran and well-know guide Chris Bullock of Kerr Lake Crappie & Cats. Bullock was frustrated with a water temperature that has fallen almost 10 degrees in the last week, snow last weekend, surprising rainstorms mid week, a rapidly changing barometer and high winds. Clearly none of these are favorable for crappie fishing. Bullock mentioned a small group of crappie spawned in February when warm and stable weather ruled, but credited a wet and cold March for sending the crappie back toward late winter patterns. The good news is that slabs continue to show. In fact, Bullock caught them up to 2.6 pounds in the last few days. Our largest yesterday almost reached two pounds, but fell short by a few ounces. We landed a half-dozen fish from one-to-two pounds yesterday and many smaller ones. But, given the conditions we had to work hard for them. We talked to many anglers (including guides, locals and tournament anglers) who were all struggling to establish a consistent pattern. Inconsistency ruled. On the other hand, anglers who fished hard still managed to catch crappie just as we did. With patterns in limbo, however, we opted to long line. Reports from single pole anglers in the bushes were poor. High winds kept us from spider rigging. Long lining enabled us to cover more water and attempt to locate fish. Doing so with 25 mph winds was a chore, but we managed to land some nice fish. In addition to the crappie we also caught a nearly 10-pound striper, a white bass and two small largemouth, all while targeting crappie, specifically. We released all species, including the slab crappie. Our action came exclusively on live Chartreuse Fire Dye minnows. Last year when we filmed on Kerr we mixed it up by using regular minnows on one side of the boat and chartreuse on the other. Bullock mentioned that for the last month the chartreuse minnows were out-fishing regular minnows six-to-one, which prompted us to only use the chartreuse. He tipped them on homemade crappie jigs. There were three of us on his pontoon and we ran 16 rods – in the wind. As you can imagine we went through a lot of minnows. Bullock believes as soon as weather conditions stabilize the crappie bite will take off again. That could happen late the first week of April. He believes we need three days of consistent weather to re-establish a pattern. 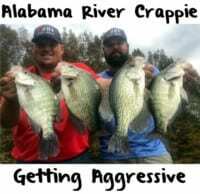 Once that happens crappie fishing will take off again. (Below) White bass caught while targeting crappie. Editor’s Note: Chris Bullock operates Kerr Lake Crappie & Cats. He fishes Kerr almost daily year round. To inquire about his guided Kerr Lake crappie trips please call 252-902-4039 or visit http://kerrcrappieandcats.com.